Public open-air event - Water and Light Festival Bressanone / Brixen. Luce Dipinta member Alex Rowbotham will be presenting a new projection created specifically for the festival. In Piazza Maria Hueber - just one of the many artist installations that will run in the city every evening for 17 nights. Public open-air event - CHRISTMAS and NEW YEAR'S EVE - do you know the perfect place to create a video mapping project to welcome 2020? Let us know if you'd like to commission Luce Dipinta for your Christmas and/or New Year event or party! 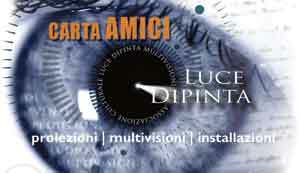 Luce Dipinta Multivisioni was formed in 2007 as a non-profit organisation to produce cultural projects using image and sound, essentially multivision shows, or audio visual presentations, performance art and one-off events. To encourage a wider understanding of multivision and of the potential using the ever expanding digital technology which has come to replace the traditional slide shows and the associated production processes. Luce Dipinta, with its growing membership, can project manage and produce complete shows and events for other cultural groups, organisations and individuals, or provide consultation, guidance, expertise and co-operative production with the client or artist/s. For the final presentation Luce Dipinta utilizes the expandable systems of Dataton WATCHOUT and StumpflAV Wings Platinum which have become the industry-standard software for high-impact, multi-display production, presentations and performance. The digital projectors that we use vary in size and quality depending upon the project at hand, from 2200 - 20000+ ansi-lumen. Use them to create seamless panorama shows as wide as you like, or put your ideas on walls made of displays, or monitors scattered in different rooms. Use graphics, photographs, animations, video, live camera, surround-sound and unleash your creativity! We also have a growing library of ready finished shows that are available for use at your event, you pay minimum fees to cover the authors fee/s and and related installation and staging costs. Luce Dipinta will set-up and run it for you. Whilst part of this phrase is so obviously linked to multivision and performance, we also believe that without the message there would be no medium and no multivision, if there is a message and it is not told well, then the same would still be true. Multivision fills, and feeds, the gap between popularized digital media and our traditional methods of knowledge dissemination, it is more than just educating or entertaining an audience. Used correctly the balance between the two becomes equal to the point of being invisible. When the audience becomes totally submerged in only the experience, only then has the production succeeded. It should leave a lasting impression with them, one that will continue to engage thoughts, analysis and perhaps encourage proactive participation to the cause in question. Merely owning the software and hardware to create multivisions does not, in itself, provide the means to create a successful presentation, an emotional and memorable experience. Without having strong ideas, design and relative experience, there will not be the symbiotic relationship to which McLuhan referred.